Julie (?) married Ed Houghton. 1920 Census 1920 Birmingham, Jefferson Co., AL, USA, age 49, building superintend., Swift Co.
Elmer Elliot Houghton married Mary Jane Sentelle in circa 1897 age 26 and 25; mar 3 years in 1900 census. Mary Jane Sentelle married Elmer Elliot Houghton, son of Francis Merrion Houghton and Clara Jane Rollins, in circa 1897 age 26 and 25; mar 3 years in 1900 census. Frank Sentelle Houghton married Rhene T. Swart. Rev. Edgar E. Houghton Jr.
Rev. Edgar E. Houghton Jr. married Christine R. (?) in circa 1929 age 28 and 25. Agnes K. Houghton married Raymond Anderson. Francis Merton Houghton married Lula Eliza (?) in circa 1908 age 26 and 22; her 2nd mar; mar 2 y in 1910 census. Lula Eliza (?) married Francis Merton Houghton, son of Francis Merrion Houghton and Clara Jane Rollins, in circa 1908 age 26 and 22; her 2nd mar; mar 2 y in 1910 census. Francis Merton Houghton Jr married May Reeves in Jan 10, 1935 at Etowah, AL, USA. 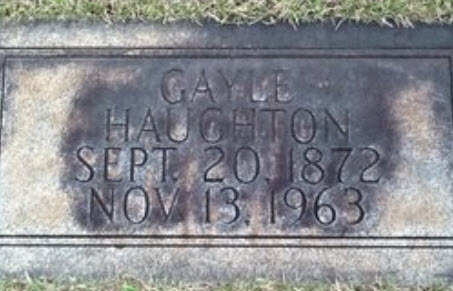 Gayle Haughton Sr married Martha Matilda Davis in Dec 15, 1897 at Dora, Walker Co., AL, USA. Sara Ellen Haughton married Eric Rodgers. Notable President of Lockheed Aircraft Corporation. Daniel Jeremiah Haughton married Martha Jean Oliver in Sep 28, 1935 at NV, USA. Gayle Haughton Jr married Charlice Ellen Foster in Nov 20, 1920 at Arley, AL, USA, 20 at 1st mar. Zala (?) married George Houghton. 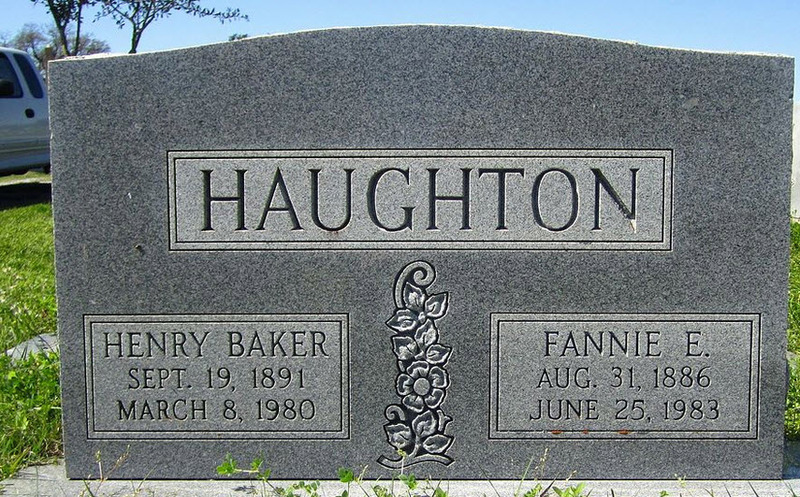 Henry Baker Haughton married Fannie E. Ellsworth in Sep 15, 1917 at Mobile, Mobile Co., AL, USA. Fannie E. Ellsworth married Henry Baker Haughton, son of Robert Henry Haughton and Fannie (? ), in Sep 15, 1917 at Mobile, Mobile Co., AL, USA. James Houghton married Lydia (?) in circa 1893 mar 17 y in 1910 census. Lydia (?) married James Houghton, son of (?) Houghton, in circa 1893 mar 17 y in 1910 census.